Gospel music is rooted in the folk tradition of America. It is music from the heart and soul and appears wherever people gather to express their spiritual joy. Folk instruments such as the guitar, banjo, mandolin, ukulele, and autoharp lend themselves to this kind of group singing. They can provide simple accompaniments or carry the melody in a small group of a full fledged revival. 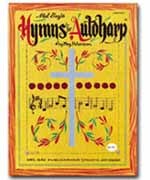 The autoharp blends in well with the spirit and harmonics of these hymns. The first section of this book is chorded for simple strumming. The second section is arranged for melody playing, with string numbers indicated. A popular collection which includes 69 songs!